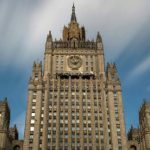 Estonia’s decision to refuse accreditation to Rossiya Segodnya journalists seeking to attend the EU’s ministerial meeting in Tallinn undermines the bloc’s authority, the Russian Foreign Ministry said on Tuesday. Moscow slammed Tallinn’s decision to bar Rossiya Segodnya reporters from covering the EU’s ministerial meeting due to take place in the Estonian capital on September 7-8. The foreign ministry described the Estonian leadership’s media policies as “hypocritical” and undermining the authority of the European Union. Moscow urged relevant international organizations to pay attention to the case and take measures to prevent the infringement of Russia journalists’ rights.